Membership in the VSA is open to anyone who is interested in the instruments of the violin family and their bows. The growing membership from all parts of the world includes makers of instruments and bows (both amateur and professional), concert artists, professional and amateur players, collectors, dealers, music lovers and violin buffs, conservatories and libraries. Your membership helps to promote the art and science of making, repairing and preserving stringed musical instruments and their bows through publications, conferences, competitions and workshops. VIEW/DOWNLOAD THE MEMBERSHIP BENEFITS FLYER! 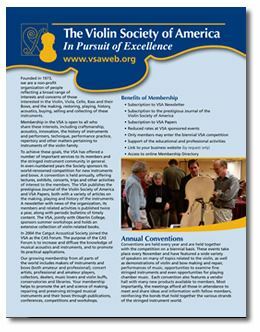 Cozio is offering a 25% membership discount to VSA members on subscriptions to its archive of fine instruments and bows. The annual subscription is reduced to $75 from $100. To take advantage of this offer, please contact cozio@tarisio.com quoting your VSA membership number. The Catgut Acoustical Society (CAS) has joined the Violin Society of America as the CAS Forum. The purpose of the CAS is to increase and diffuse the knowledge of musical acoustics and instruments, and to promote its practical applications. All VSA members may join the CAS Forum at no extra cost; to do so, check "CAS Forum" on the membership application. A membership in the VSA makes a wonderful gift for any violin lover. A letter indicating the gift is from you will sent to the recipient. To give a gift membership, fill out the name and address of the recipient on the membership application, using your own credit card information. Then send a separate e-mail to info@vsaweb.org with your own name and other information you would like included in the letter. Memberships are made available at greatly reduced rates to students. To be eligible for this rate the student must be enrolled full-time at a primary or secondary school, college or university, or at a violin or bow making school or apprenticeship program. $45 for full-time students in US, Can., Mex. The Violin Society of America does not make its mailing list available to anyone for any commercial purposes. However, a membership list containing members’ names, addresses, listing phone numbers and e-mail addresses will be made available to members only upon request, and for a fee. This list, will be for the personal use only of members so that members can contact one another. The list may not be sold, given away, duplicated or used for any mass-mailings. Members may elect to have their name only, with no other contact information, on this list. To do so, please e-mail your request to info@vsaweb.org or by mail or phone. If we do not hear from you, your contact information will be placed on the membership list. You will be given the option on each membership renewal form to again decline placing contact information on the list. The listing phone number on this list will be your business phone number if we have it in our records; otherwise we will use your home phone. If you prefer that we use a home phone as a listing phone, or that we do not list a phone number at all, please contact the office. This membership list is available to members for a fee.